Begin now...teach this effective STAAR test taking strategy now...then it will be a habit in April!! 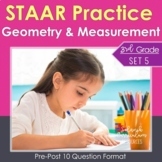 Math Test-Taking Strategies for STAAR! Success NOT STRESS! These test taking strategies can be used with your students to help them achieve higher scores on the revising and editing portion of an exam. This is a great little power point to show your 3-5 graders the day before the big STAAR test (Texas state test). Just some simple reminders! This page is to help with test taking skills for the 8th Grade Science STAAR test. Many of the questions have so many layers and unpacking the questions can be a challenge for 8th graders. Use this page to scafold test taking skills for those students who need it. This is an anchor chart for a test taking strategy students can use for a variety of exams, including the STAAR. Since it is a digital file, it can be printed in a poster size to be placed on a classroom wall, or be printed on a regular sheet of paper for students to have an individual reference. This is an anchor chart of a test taking strategy students can use for a variety of exams, including the Math STAAR. Since it is a digital file, it can be printed poster size to be placed on a classroom wall, or be printed on a regular sheet of paper for students to have an individual reference. This PDF can be used in PowerPoint mode. It is set up for Cornell Notes. 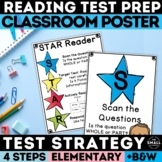 This is a PDF document for test taking strategies for the reading STAAR test. 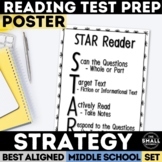 This is an acronym to use for reading STAAR test taking strategy.